Can Recess Slow Childhood Obesity? In almost all cases evolution is a good thing. The fact that I am sitting at a desk typing is evolution — my prehistoric ancestors found relief by banging their hands against a rock. The president's recent announcement that he has become fully evolved on the issue of marriage equality is another sign that over time, good things do indeed happen. Conversely, the aggressive rate at which the obesity epidemic is evolving in the black community is a travesty. Recent articles, like Alice Randall's op-ed in the New York Times last week, would have you believe that black women, who are 60 times more likely to be obese than any other group, "want to be fat" and that they "love their curves" because they show their "wisdom." The reality is no one loves diabetes, hypertension and heart disease, all of which are side effects of obesity. The very idea that black women love being fat, as Randall suggests, is not only absurd; it's dangerous. According to the Office of Minority Health at the U.S. Department of Health and Human Services four out of five black women are obese — that is nothing to love or celebrate. The causes of obesity include a variety of health and economic issues, but it is also important to note that family trends and environmental factors also play a role. According to a 2010 brief from the Center for American Progress the rate of obese and overweight Hispanic and African-American children and adolescents ages 2-19 is approaching 40 percent, while the rate among their white counterparts remains below 30 percent. Why this gap? There is a clear correlation between the health and wellness of parents and their children. Therefore, if large numbers of adult black women are obese and they have children, the probability that their children will also be obese is extremely high. Obese children turn into obese adults. So how can we temper the alarming childhood obesity rates? Access to healthy foods has long been named as a major reason for the obesity trend but it's not the only culprit in the black obesity epidemic — access to the outdoors plays a prominent role as well. The National Wildlife Federation's Eco-School USA program recently launched the Healthy Living Pathway initiative, which emphasizes the importance of outdoor time but also encompasses other aspects key to healthy development, including general physical fitness and unstructured play. 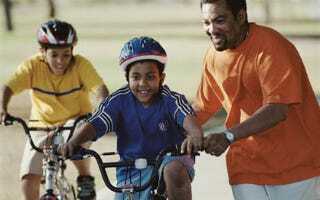 A study by Active Living Research (pdf) stated that children can get up to 40 percent of their exercise through recess. Yet that same study also mentions that black and Hispanic kids are less likely to have recess than their white counterparts. "Large urban areas in the United States remain flashpoints for violence and property crime, which attract national attention and cause many to question the safety of their own communities. Moreover, residents who live in communities plagued with dilapidated buildings, unkempt lots, crumbling or nonexistent sidewalks, crosswalks and bike lanes, may not feel as safe as residents who live in well-maintained communities." Who wants to go outside and play, jog or walk in a park that is coming apart at the seams? Not me, that's for sure. The outdoors is an easy and inexpensive way to stay healthy — no membership or medication required. But before the outdoors can be used for health and recreation it must be safe. So instead of placing blame or attributing banal stereotypes to why obesity is trending in the black community, we may want to take a look at the environmental barriers that exist that have yet to evolve from bad to green. Danielle Moodie-Mills is the senior manager of Environmental Education Campaigns at the National Wildlife Federation and adviser to LGBT Policy and Racial Justice at the Center for American Progress. Read her musings on politics and pop culture at www.threeLOL.com. Follow her on Twitter.